Small things can make a big difference. That’s the theme of this episode of Anecdotally Speaking. In Episode 20, Twists and turns of a flying fortress, we hear how a checklist saved Boeing from going under and offered a key advantage to the US Army in World War 2. It’s a versatile story, which makes it great for business. Mark and I also talk about the misconception that some people have about story being an outcome, rather than a tool to achieve business outcomes. Some people believe that by just adding the label ‘story’ to a heap of information it magically turns into one. To help you avoid this, we have a one-pager containing our story patterns which you can use to take non-story information and turn it into an actual story. To get this, all you need to do is email people@anecdote or comment here on this post. This story demonstrates the power of a checklist, and so we’re also offering a checklist to our listeners. 30th October, 1935. Competition between two big aircraft corporations, Boeing and Martin & Douglas. Vying to win a big defence contract for the US Army Air Corp to pick the next long-range bomber. Boeing way ahead. Model 299 was regarded as super advanced. It could carry five times the amount of bombs than any other aircraft, go twice as far and twice as fast. Army was going to order 65 of the aircraft. Army brass gather on the day of testing on the airfield to watch the shiny, aluminium aircraft taxi down the runway. Propellers fire up. Takes off at a steep angle 300 feet into the air. Stalls suddenly, wing dips to the left and comes crashing down straight into the nose in a massive explosion. Two crewmen killed. Everyone is stunned. The very best test pilot in the US Army, Major Ployer Hill, was testing the plane. Investigation began, and it was concluded that the cause of the crash was human error. It turned out that the extra capabilities, engines and procedures to fly the plane caused him to forget a new locking mechanism they’d put in there and consequently didn’t unlock the rudder in the tail. When the investigation report came out, the 299 was deemed too complicated for one person to fly. Douglas was chosen for the contract. Boeing almost went bankrupt. Army bought a few to do some testing and find out what they could learn. A few test pilots got together and worked out what it was that they had to do. They knew that doing more training wasn’t going to work. Ployer was the best, and it didn’t work for him. They wanted something simple. So they came up with the basic idea of a checklist. It goes on a small index card with takeoff, landing and emergency checklists. With the checklist in place, the 299 ended up flying 1.8 million flies without an incident. The army ended up ordering 13,000 of the aircraft. It was called the B17 Bomber, also known as the Flying Fortress. It became a decisive advantage that they had in the air for World War 2. And I’m Mark Schenk. Well before we get started with today’s story; I’ve just come back from the U.S. where one of the things we did was we exhibited at the ATD Conference in Dan Diego (Association for Talent Development conference). I got to see Barack Obama do the Monday morning keynote. And we were exhibiting in the Expo Hall. I had conversations with hundreds of people and so it was a really cool event. Tell me what was Barack Obama like? He was good. There was one very memorable story that he told and there were many others that were nearly stories but weren’t quite. But regardless but pretty much anything he said the crowd was going crazy. He’s got the pulling power. Oh yes. I was there with like 15,000 of my closest friends that morning. I had 100s of conversations during the course of those three days we were exhibiting and one of the things I noticed was so many people came up to me and said, ‘oh storytelling. We totally need storytelling in our organisation’. It’s like they were thinking storytelling was an outcome; ‘oh yes, we’ll just get storytelling’. Just sprinkle on a bit of storytelling. Exactly—condiment. I kept pointing out to them that storytelling in business is not an outcome; it’s a tool to achieve business outcomes. And of course, that’s one of the things we focus on; the view that story is not an outcome. It’s simply a device, a tool and if you know how to use it you can get better outcomes. I was very interested to note that view (that story is an outcome) is still pretty prevalent. One of the other things I noticed was that a number of people came up to me afterwards (several people were talking about storytelling). After one of the presentations somebody came up to me and said they’d just attended a storytelling presentation and they’d shown some of our stuff in the presentation (with full attribution which is fantastic). But their observation was this lady gave an hour long presentation on storytelling and didn’t tell a single story. That’s a bit of a pattern that we’ve seen. People love that word ‘story’. One other thing that also highlights a bit of a challenge in the world of storytelling; a lady pulled out her resume and handed it to me and said, ‘Mark, here’s my story’. I pointed to it and said, ‘that’s a resume’. That’s a piece of paper with information on it. That’s not a story. That’s another barrier to the take up of stories; this habit we have of pointing to something and calling it a story actually makes it a story. That’s right. And people really push back when you say it’s information, a point of view, it’s not really a story but ‘no, this is my story’. They really get put out by any sort of pushback. But you can’t get that benefit of storytelling unless you actually tell a story. It makes sense. It sounds like an inane thing to say but it is just a fundamental truth. Stories are powerful. You need to be telling stories. Now, we have some events coming up and I just thought I’d let people know about a couple of public workshops. We don’t often do public workshops in Australia but we seem to have a done a few more than normal this year. Coming up we have a workshop on the 11th of June in Brisbane. Mark’s running it. If you want to attend any of our public workshops the best thing is just go to our website anecdote.com and go to the events page and you’ll see all the events that are happening. There are also ones in Sydney and Melbourne and then we are doing some others overseas so you’ll see that on the events page as well. So standby for one in Madrid in September. For our Spanish listeners so hang out for that. So, today’s story is really about how small things can make a big difference. It happened back in the 1930s, in fact, 30th October 1935. And it’s a competition between two big aircraft corporations: Boeing and Martin & Douglas. They’re vying to win a big defence contract for the U.S. Army Air Corp to pick the next long-range bomber. Boeing was way ahead. Its aircraft were regarded as just so advanced by comparison with what Martin & Douglas had available. It was called the model 299 and among other things it could carry five times the amount of bombs than any other aircraft out there. It could fly twice as far as any other bomber out there and do it twice as fast. The army was going to order 65 of these. This is a big contract. On the day the army brass get together on the airfield watching this beautifully sleek, shiny aluminium aircraft taxi down the runway. As it’s getting ready to take off the propellers are firing up. You’ve got this beautiful sleek silver aircraft sitting on the runway ready to go. It fires up, takes off down the runway and with this steep angle takes off. Three hundred feet into the air it looks like it’s going beautifully. All of a sudden the whole thing stalls. One of the wings dips to the left and it comes crashing down straight onto the nose, massive explosion, kills two of the crewmen on the flight. And everyone’s stunned. And they couldn’t believe it because on that day they had the very best U.S Army test pilot flying this thing. It was a guy called Major Ployer Hill (obviously a very popular name back in the 30s). But Major Ployer Hill was the most capable, experienced guy. They did an investigation and they discovered it was human error. It turned out these extra capabilities, avionics, four engines (mixing fuel and oil for each engine separately) and a whole range of extra things he had to do that he had forgotten to release a new locking mechanism they’d put in there. He didn’t unlock the rudders and the elevators that were built into the wings and tail. After this investigation report came out people were saying the 299 is too difficult for one man to fly; it was impossible. Now on the day, Douglas won the bid. Their planes got picked up and that was another part of the story. But Boeing almost went bankrupt as a result of this. Their reputation would have been in tatters after that. You can just imagine it can’t you. But the army did purchase a handful of those 299s because they thought let’s do some testing and let’s see what we can learn. And there was a group of insiders, true believers, who thought this aircraft has got legs, let’s see what we can do to see how we can fly this thing. They got a bunch of test pilots together and they worked out what they were going to do. One of the interesting things was they knew that doing more training wasn’t going to be the thing (Ployer Hill was one of the best). No one else was going to be trained better. So, they said what can we do which is a simple solution and they came up with the idea of a basic checklist—as simple as that. They were going to put it on one index card; the checklist for take-off, landing, a few other things like that, emergency situations. And here’s the thing; the 299 ended up flying 1.8 million miles (once they got the checklist up and running) without a single incident. And the army ended up ordering 13,000 of these suckers. So, Boeing were back in the black. 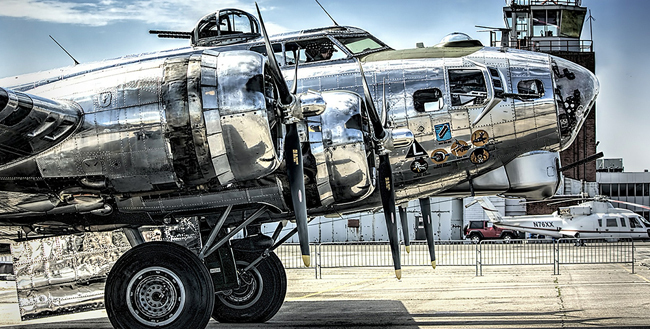 We all probably know the name of this aircraft–the B17 Bomber. Some people called it the Flying Fortress. It became for the U.S. a decisive advantage in the air in WW2. The B17 long-range capabilities and bomb carrying capacity combined with the P51 Mustang fighter aircraft were able to maintain air superiority over Europe and the Pacific and were a dominant factor in winning WW2. And all down to the simple idea of a checklist. Which is standard procedure for every aircraft whether it’s a one engine or an A380; they run on checklists. That’s the story. I think it’s amazing that some industries use checklists quite regularly—a simple thing but other industries don’t feel like they want to do that. This story came from Atul Gawande’s terrific book The Checklist Manifesto and he makes the argument in his industry, the health industry. He’s trying to get checklists adopted into hospitals and other complex environments where if you can just follow a few basic things to make sure everything is done he’s shown it has an amazing impact in those sort of spaces as well. So that’s a cool story. Tell me, Mark, what are some of the things for you that made that story work? For me it was the disaster and recovery. On the one hand you’ve got the high expectations which suddenly come crashing down literally. The fact that Boeing nearly went out of business but then through the efforts of some people who believed they came up with a solution. There are nice bits like that. You can tell that there are big stakes involved; the life and death of companies, the big dollars involved when you’re talking about that many aircraft, so you can clearly see the stakes at risk in the story. Definitely—a number of twists and turns. I think one of the other elements that add to any story is the disaster element, the fact that you’ve got death occurring and fire and explosions on the runway. These sorts of things, as humans we’re totally drawn to them. We can picture it and it’s something that’s memorable for us because we want to avoid death. That’s an element as well. And we might have already mentioned it; the high stakes, the fact that this has a huge impact for Boeing and the eventual impact of the B17’s contribution to WW2. I like the idea that such a small thing can have that great ripple effect in the world. That’s a nice message as well. And some of the imagery; the aircraft roaring down the runway, taking off steeply and then the unfortunate imagery of the aircraft stalling (and for any of you that are jumping on an aircraft soon you’ll want to try and wipe that from your mind especially if you’re a nervous traveller). Now for those of you listening at home, as I was telling this story, Mark with his air force background, was grimacing many times as I got the terminology slightly wrong (quite wrong in some cases). But you need to get it mostly right, don’t you? I think there was a bunch of things I stumbled over. I was coming out with ‘elevator’—what the hell is an elevator? ‘He unlocked the elevators’. The rudder—it took me awhile to work out that was in the tail. I did recover on that. Yes, the rudder is relatively important when you’re flying an aircraft. So, they were the things that made it work. What are your thoughts on what could make it a better story? One thing that springs to mind for me is I think you could make a shorter version of that story. You don’t need to tell all the ins and outs of that because really at the end of the day they have a competition, the aircraft crashes, they try something new and it succeeds. That’s essentially the story. There is also the important bit about the fact it was pilot error so it was complicated. Making it shorter would give it more punch. Most stories are almost infinitely compressible and expandable. So, it depends on the amount of time you’ve got, the extent of the audience interest. I’m quite interested and wanted to hear all the details so I didn’t mind the length of the story. So again; how much time you’ve got, who the audience is. But there is definitely the opportunity to tell that in the 90 second version. Yeah, I think so. My version would have been a four or five minute version. What about where we tell it? What are the situations where we might give this story a run? I guess there’s the situation where Atul told it in the first place: making the case for checklists. So, if you’re trying to get your team to adopt some basic checklists to get things done that’s maybe a story you could tell. You could also extend it to process where you’re trying to get a process in place and people are resisting, ‘no, no we don’t need a process, we know how to do this’. We’re experts. But that’s the thing, Ployer Hill, he was an expert, the very best but he still couldn’t get his head around all the things he had to do. I agree. That’s definitely one of those things. We love to say, ‘small things can make a big difference’ and this is just a story that backs up that point. We are often trying to help people design interventions to have an impact in culture change in an organisation. And one of the principles that we are invariably trying to get across to the people designing things is to not over complicate it. We love to come up with really complex big things that other people should do. Exactly. We’re trying to flip it on its head and say let’s come up with small, simple things that you could do. And this is a good story that illustrates that. It’d be very useful for trying to get people in the right mindset for thinking about the action they’re going to take to change the culture or increase diversity inclusion. For me one of the ways you could use this story effectively is as an influence story because there are many situations where great ideas wither on the vine because people don’t believe in them. The ideas get written off. There is one mishap and people go ‘nope, that won’t work’. And it is hard to change people’s minds when they form that story; when they’re telling themselves that story. The 299 is too complex to fly so let’s forget it. And there are many situations like this in a business environment where people do have their minds set against an idea. You know; partnering won’t work. We tried partnering two years ago with Acme and it didn’t work. And you can’t tell them they’re wrong. Part of the influence story pattern is you have an example that illustrates that there is another way of thinking about this. You still have to match the story to the culture of the organisation. There will be some organisations where a story about Boeing bombers is not going to fly. I’m thinking if you’re in Greenpeace that’s not going to fly. Exactly, so you’ve got to match the story type to the people you’re sharing that story with. And that’s a great lesson. A really effective story in one context might have very little effect or even the opposite effect to what you intended in a different context. One of the tests you need to apply when you’re practising is will this story make the impact I want in this context? Right, I think that pretty well wraps it up. We’ve got to give it a rating? I told the story so I guess you get a crack at it. It’s not just my air force background but I’m going to give this an 8 because I think it’s an incredibly versatile story that can be used really effectively and simply to make that important point. It’s a powerful story that makes a very good point. I’m going to give it an 8 too because I think it’s one of those ones that can be used. It’s a really useful, versatile story. Wow, did we actually agree on something there? Now to the special offer that Shawn mentioned. The story today was about the value of checklists so we’ve produced what we call ‘The Quick Guide to Story’—it’s one page, kind of like a checklist. We’ve designed this to give people a very quick overview of the key storytelling patterns. I think you’ll be able to use that well. So, I think we’ll wrap it up. Thanks very much for listening to Anecdotally Speaking and tune in next week and we’ll have another episode for you on how to put stories to work. How lucky you were Mark to hear Obama for free! Please send me the free (!) giveaway! The train lurched … I meant “good one”! Interesting how quickly people turn to ‘human error’ as the cause of the accident. It is actually a systems error – the system is too complicated for reasonable control by the pilot – particularly under conditions of stress. This is known as Bounded Rationality. Such a simple answer, not rejigging the pilot.